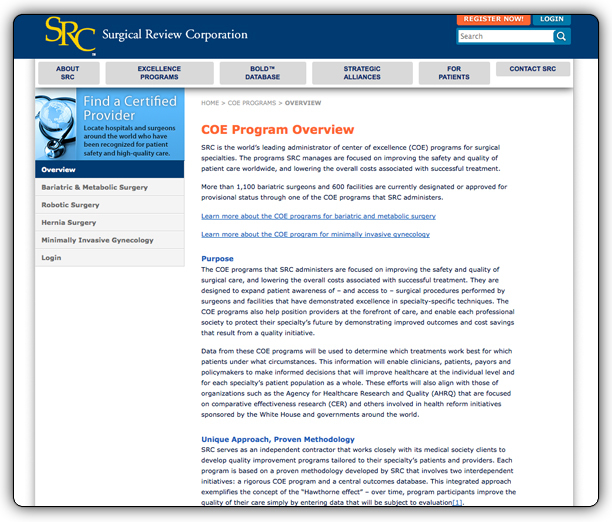 Surgical Review Corporation provides accreditation, consulting, education and data for surgeons and facilities to advance safety and quality of care for patients. Surgical Review Corporation approached IONA to implement a more strategic online brand presence and experience for its customers. Over a two years time, IONA worked with its Marketing Director to define and create a solution that would allow its members the ability to easily understand SRC’s offerings and easily navigation large amounts of documentations and resources. 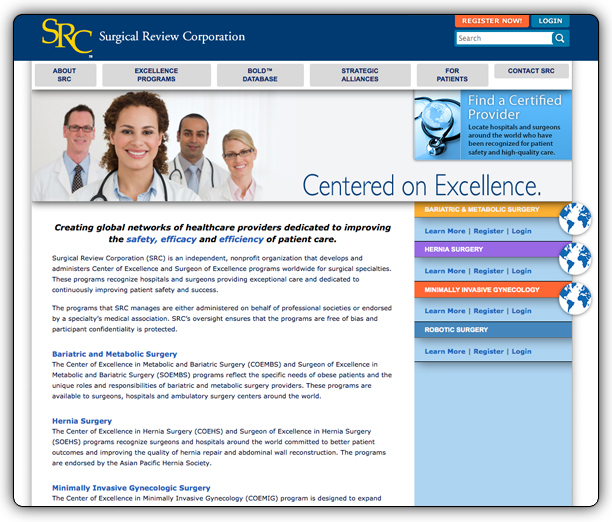 IONA created www.surgicalreview.org to allow users to easily gather new information regarding accreditation and education. By creating easy to use search functions, users were able to easily access local accredited providers with the world’s gold standard of quality surgical care. Moreover, SRC members were offered a robust set of online services using the members login space as a point of interaction with SRC. Through the use of an easy to user content management system customized specifically for SRC, the marketing team was able to easily manage the sites assets – including photography, content, and documents. By offering SRC this tool, marketing was left with the ability to respond quickly to the needs of its customers and business objectives. By not relying on the skill set of digital experts after launch allowed SRC to quickly benefit on their investment and budget for additional digital projects as needed.